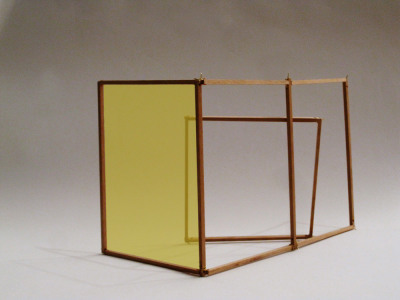 My Schindler Lab proposal is for a fluid set of sculptures which are composed of several sets of hinged hardwood frames, partially stretched with semi-transparent scrim material or fabric. 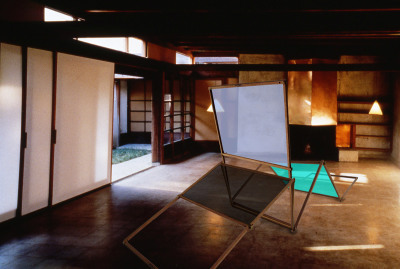 The partitions of color would allow viewers to see through them, into the Schindler House and to other viewers. Built with clearance for the tallest applicable entrance to the house, they would be made with a high degree of durability and strength, allowing them to be continually moved and repositioned. Cabinetry hinges would be used so that positions could be successfully articulated and repeated. The sculptures will be repositioned once a week, at a regular time, by performers. 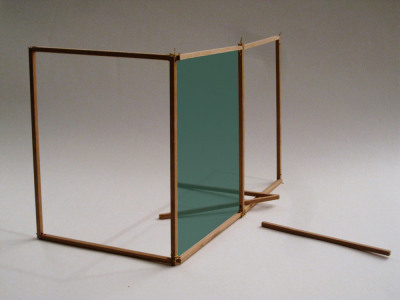 Different positions will activate transparencies, opacities and obstructions created by the colored fabrics. The positions of the sculptures will be a dynamic aspect of the work, like the changing light of day is to Schindler House itself. The original process Schindler used to raise the poured-and-cast concrete walls strikes me as a performative action, as well as a structural one. The walls were raised once, but there is forever the memory of their horizontal position from the construction process. My sculptures will echo that performative action of construction, and continue to assume new positions, assigning changing pathways and views through the Schindler House. Sandy de Lissovoy is a Los Angeles-based artist.